Enjoy a feast filled with traditional Kwanzaa food when celebrating Kwanzaa this year. Nothing can bring family and friends together more than good food. 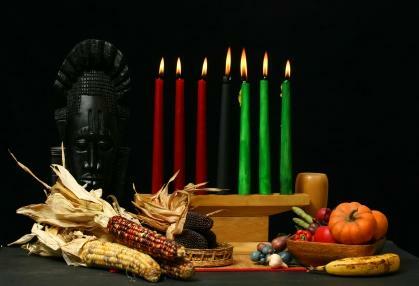 Each year on December 31, Africans and African American families gather together to celebrate the feast of Kwanzaa. Kwanzaa celebrations focus on African culture, community and family. The celebration lasts an entire seven days, from December 26 to January 1, with the last night being the feast celebration. One aspect of Kwanzaa is the use of colors. Black, red and green are used as part of the celebration and for party decorations. Each color has a special meaning. Green represents Africa and hope, black is the color of Africans and red symbolizes the blood shed by ancestors. The Kwanzaa feast or Karamu includes food, African music, dancing and a ceremony. Many celebrations incorporate story telling and gift giving on feast day as well. A table is set up and decorated in a special way. A candle holder with seven candles is at the center and the straw mat is laid down to hold each symbol. As with most celebrations, food is an important part of the day. A traditional Kwanzaa feast can be held at home, church or even at a community center. The food is served buffet-style where everyone helps themselves. Each family or person participating in the feast can bring a dish of their choice to contribute. Before and after the meal, a ceremony is performed to celebrate the meaning of the holiday. When planning for the feast, select harvested fruits and vegetables as part of the menu. The word Kwanzaa means the "first fruits of the harvest." African seasonings such as cumin, paprika and coriander are commonly used in various dishes. There is no set menu for a Kwanzaa feast; meals usually consist of traditional African favorites and recipes that have been passed down through the generations. The following is a sample menu for a traditional feast. To start off the celebration, serve appetizers such as Koki. It is made from black-eyed peas, which are thought to bring good luck. Corn fritters are another option to start with. Bring to a boil the water, peas, broth, sausage, onion, and red pepper flakes. Reduce the heat and add the white rice. Next, simmer until rice is tender and mixture is thick. Remove from the heat and allow to cool slightly before serving. Serve a variety of Kwanzaa food at your celebration to honor African heritage and satisfy your guests. There are a wide range of choices so there is sure to be something that your family will enjoy and want to keep making year after year.